May Special – Have You Tried Frugie Beef? We are excited to bring you this month’s meat special. 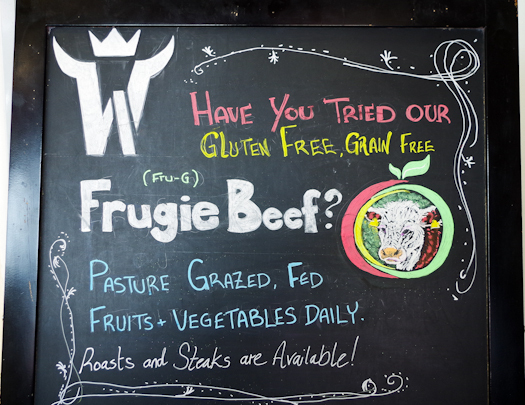 For May we are featuring Frugie Beef from Langley. Frugie Beef represents the type of product we specialize in, local, ethically and humanely raised animals fed a vitamin rich healthy diet with no hormones, antibiotics or steroids. Frugie Beef cattle are fed with fruits, vegetables, grass and hand cut harvested hay for a natural consumption of pro-biotic feed. The beef is high quality, low fat, low cholesterol plus all the qualities you wish for in your meat, tender, moist, flavorful and rich in vitamins, nutrients and minerals. Since we are so enthused with this product, we want everyone to taste the quality. That’s why we are giving a 20% discount on this month’s special pack. Save 20% off our regular price! You can see them feeding here.